Did Snow Patrol open for Calvin Harris or did Calvin Harris afterparty for Snow Patrol? To quote my brother who enthusiastically joined with my sister in law, Dubai is now on the music map and Sandance is one hell of a music festival. I have seen Faithless and Example there too! My musical wishes come true in Dubai. I have only known Snow Patrol for 6 months. I bought their latest album and my children listened with curiosity to this Indie group as we drove the streets of Dubai. This musical experience was supplemented by the regular playing of their older tracks on 92FM. And successfully, at this concert, unlike some other concerts when I don't know every song played, I was actually proud to recognise them all. 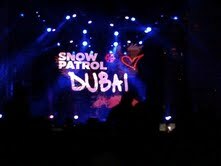 In a magical way, Snow Patrol played with the fibres of my heart. I expected their music to render me teary eyed. Cold Play does that to me, especially when played live. However, and in a beautiful way, Snow Patrol's tunes and lyrics left my heart "in suspension": squeezed it but their music is too happy minded to be tear jerking. "Just say Yes!" is what they request! 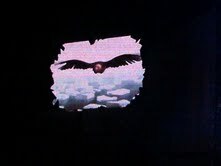 Three men with guitars, with special effects of a solitary eagle in constant flight on the background screen: it was a perfect night on Palm Dubai as I drifted to their lyrics, surrounded by a large crowd of beautiful people. To top the night, a single figure, with a very important musical name, Calvin Harris, reigned over the party with his super catchy mixes, a healthy competition to the monopolistic David Guetta. I still remember calling my brother while I was stuck in traffic: "google this song for me: "I feel so close to you right now, I wear my heart upon my sleeve!" Calvin Harris rocks! For me, yes for me only, in that large crowd of 12 thousand ravers......he mixed Paradise by Cold Play! Imagine yourself in place of the bewildered blogger's children (including little cousins),who are sitting in the Pink Taxi,with novel music at high volume,scorching the highways and avenues of Dubai.I wish some classical music and Jazz from Abu Dhabi FM 87.9 can be included in the menu. 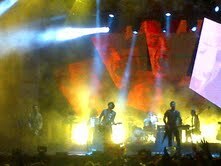 Though I recognize Snow Patrol's talent and they are an excellent live band, the highlight for me was Calvin Harris. Every generation needs their DJ. Calvin Harris answers that call. He's the current reigning DJ!